Falling out of bed when the earth shakes and bleeding from a head wound starts Private Investigator Meg Barringer’s day. Which means she’s not at her best when she gets a call about investigating the death of a woman buried alive. Meg’s investigation leads her to the charismatic and mysterious Peter Eresh, who may be the most unusual Whisper resident of all. As Meg’s inquiries take her deeper into dangerous territory, she stumbles onto a deadly plot. Not your average Pacific Northwest town, things happen in Whisper Washington that don’t happen anywhere else. Residents don’t mind, not even Meg, when she isn’t being stalked by something inhuman. Unfortunately for her, outsiders trying to control the very land upon which Whisper is built have come to town. Their interference could cause disaster for the town and could cost Meg her life. Because now, the ground itself is out to get her. 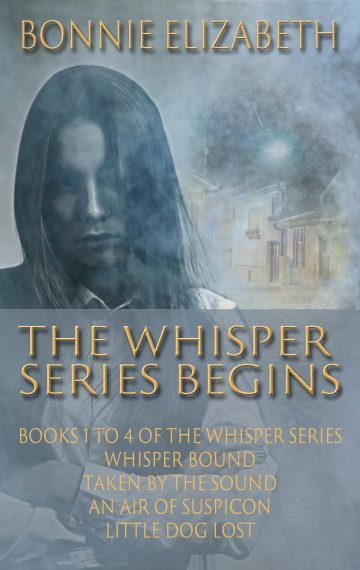 Whisper Bound is the first book in the captivating Whisper series. The mystery in Whisper Bound is a complete book in itself but readers can return to Whisper and read more about Meg, Rain, and Peter in Taken by the Sound. Who do you trust when waking on an unfamiliar shore? When archaeologists discover a burial site near Whisper, they find more than bones. Even the gods hire Barringer and Associates when they need a PI.